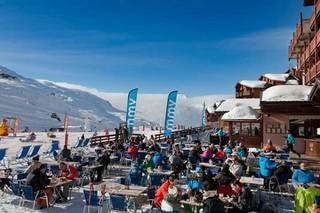 Ski hotels in Méribel : compare ! Come and discover the largest ski area in the world by booking a ski hotel room in Méribel. From your hotel to skiing in Méribel, you can choose your favorite activities between swimming pool, skating rink, snowshoeing, paragliding, heliskiing, ice climbing, snowmobiling or sleigh rides. Your ski hotel in Meribel invites you to enjoy the resort's area, which offers almost 150 km of slopes. While strolling through the streets of the village, let yourself be seduced by its charming chalets and its beautiful residences with their wooden facades which together form a welcoming setting ideal for a relaxing holiday. With its many trails in the heart of the Vanoise National Park, Méribel is a favorite destination for hiking enthusiasts. Its ski resort, meanwhile, seduce the enthusiasts of downhill skiing. In Méribel, you will enjoy a varied program allowing you to enjoy various activities such as snowshoeing and cross-country skiing. Among the places of leisure in Méribel, discover during your vacation in hotel rental ski, the Olympic complex in the center of the resort: it offers the possibility to play bowling, to skate, to swim or to s' initiate to climbing. You will also have the opportunity to discover the baroque church of Saint-Martin des Allues, a museum as well as beautiful chapels while strolling through the streets of the village. You can also indulge in shopping around the village. Thanks to Ski Express, take the time to compare in advance the ski hotel rentals available in Méribel. By comparing, you will have the opportunity to easily find a cheap ski hotel and possibly take advantage of promotional rates.